UPFRONT DISCLOSURE: I am not a very active theatre-goer in the city (Wow, that felt really good to get that off my chest). Seriously, I may check out 1 theatrical performance per year. BUT when I heard about Visitations a couple of weeks ago, I knew this was something that I just had to see (check out the interactive trailer and you will see why I was so intrigued). Now unfortunately this post is going to have limited pictures (mainly because we were told that any photography would interfere with the paranormal activity we were about to experience), but I still think it is worth blogging about as it was a very unique experience I had in the city. So I’m sure you are wondering (especially after I made a comment about paranormal activity), what on earth is Visitations? The best way for me to describe it would be an interactive, supernatural, theatrical experience (wow, that sounds like a mouthful I know!). It definitely isn’t your every day theatrical production where you sit in your chair and watch the actors do their thing (in fact you aren’t even at a theatre. Visitations takes place at the Drake Hotel and various locations surrounding it). You are very much a part of the adventure right from the moment you arrive. As soon as we arrived at the Drake, we were promptly greeted and given an envelope with our name on it. We were told that we each had a unique tarot card inside and we were to call the number on the envelope. After we called the number (and got further instructions), we entered the dining room where we got to meet some interesting characters as well as the other 22 participants on this journey. We also noticed that we were starting to get phone calls from a mysterious phone number as well as some pretty cryptic text messages. Plus I was left a pretty creepy hand written napkin and didn’t even notice who left it for me. These actors are sneaky I tell ya! After all the participants arrived, we were shown a presentation that introduced us to Lucy, her grandfather and the Sabbaticus (an ancient artifact Lucy found in her parents’ attic). We were then divided into 3 groups where we needed to solve clues to learn more about the Sabbaticus and help Lucy on her journey. Each group was given a different mission and a very different leader to follow. Our group ended up at the Beaconsfield, a random alley way, back at the Drake, and at Lucy’s very creepy apartment next door (where there was a very powerful fog machine and lots of black lights). I don’t want to give away too much as you can still check out performances next week (I believe Tuesday is sold out, but tickets may still be available for the Monday night). I probably wouldn’t recommend this experience to everyone. You have to be a pretty adventurous theatre goer and can just go with the flow as not everything always makes sense. Your guides on the journey are super enthusiastic and into their characters – but really what you get out of the experience is based on how much you are willing to participate. Asking questions and discussing clues with other members of your group really makes this experience fun and unique (and literally ‘one-of-a-kind’). You never knew what was going to happen next and were a little confused by the end of it. Great fun for a Sunday night though! 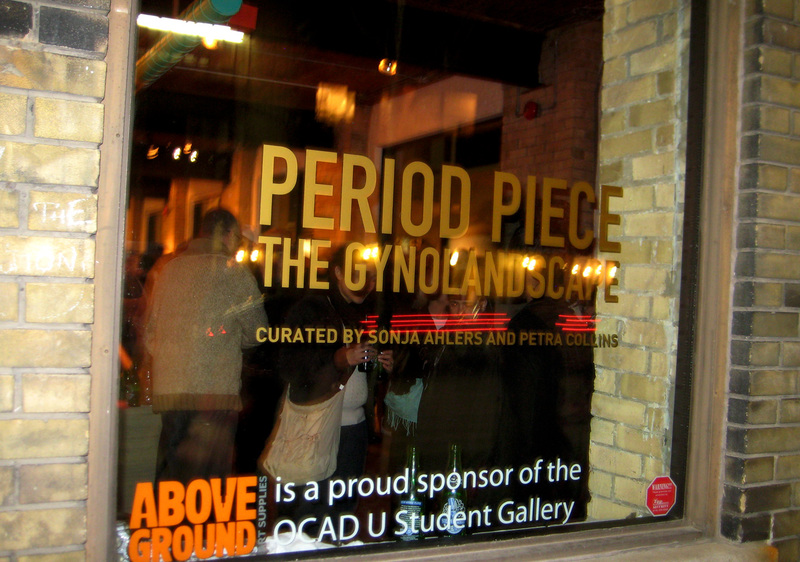 To celebrate International Women’s Day, I had the pleasure of attending an art exhibit opening entitled “Period Piece: The Gynolandscape” (have you made the connection yet between the timing and theme? Awesome I know). Now, I am not one to go to a lot of gallery openings (mainly because I never hear about them in time and I’m not really in that scene), but my friend invited me to tag along and I am really glad I did (and who doesn’t love free beer, delicious frosted cookies and a fantastic DJ playing everything from girl groups to Alanis Morissette?). Now just like I am not a food blogger, I am definitely not an art critic. A lot of the time I just like things because I think they look interesting or pretty (I am sure that is like most of us out there, right?). And I will admit, this exhibit did have a lot of interesting and pretty things (and pretty people inside to boot). What honestly caught my attention inside was the wall of ballet slippers. Now, I never took ballet as a child, but something about baby pink satin shoes just turns me into a little girl again (not sure if that was the point, but I really felt like I was missing my tutu or something). Something that I really appreciated at this event was that even the food was art. Standard Peek Frean jelly cookies were decorated with sparkles and pink frosting – YUM! And even the cake was literally a period piece (I think the picture will help explain that one. Sorry men). All of this dessert was making me hungry, so we headed over to China Town to get some late night eats. 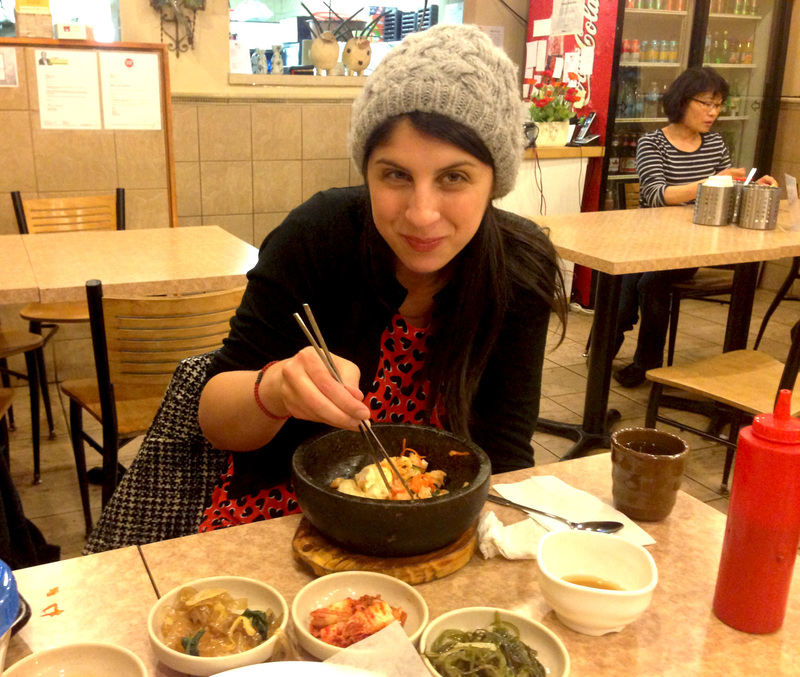 The goal was to head over to the Hen House for an All-Female Soul, Disco and R&B Dance Party, but once we got a belly full of bibimbap, it was game over. 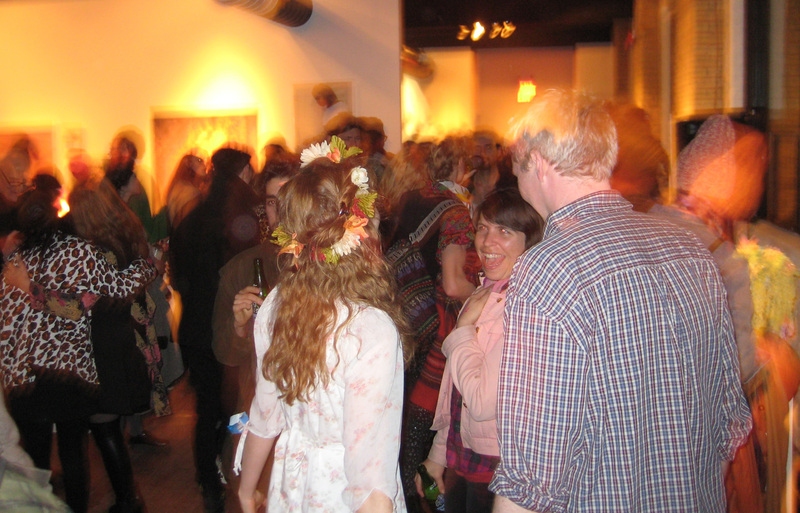 We barely had enough energy to walk to the streetcar stop – let alone dance. If you are interested in checking out the exhibit at OCAD, it is running until April 6th with various special events taking place between March 20th and April 5th. Details can be found here.